Line? 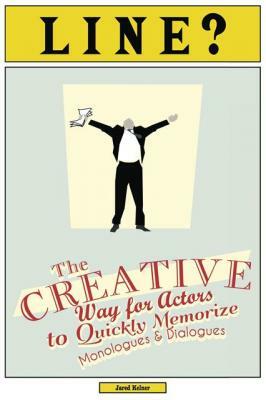 : The Creative Way for Actors to Quickly Memorize Monologues and Dialogues (Paperback) | The Drama Book Shop, Inc. If you've ever struggled to remember your lines, the creative memorization techniques taught in LINE? will help you break through your mental blocks and accelerate the line memorization process. Author Jared Kelner has applied his experience as an actor and acting teacher and combined that with his expertise as a memory improvement trainer and created an imagination and sensory based process for actors to use when memorizing lines. It's an innovative approach to line memorization that taps into the actor's imagination and acting training rather than relying on monotonous rote memorization methods like highlighting, recording and repeating lines over and over. By applying the creative memorization methods presented in LINE? you will instantly recall your lines. "I have been teaching acting for over 50 years and I rarely come across innovations to the craft process that I believe in and support. Without hesitation, I fully endorse and recommend Jared Kelner's book LINE? The Creative Way for Actors to Quickly Memorize Monologues and Dialogues. Every actor must memorize lines and most actors look at the line memorization process as something outside of the craft of acting, but in fact, it is very much an integral part of the craft process and as such, actors need a craft technique to help them. In his book LINE?, Jared Kelner brings something inventive, innovate and important to the craft of acting. The technique of imaging that Jared teaches for line memorization mirrors imaging concepts I share in my book Acting, Imaging and the Unconscious. I am pleased to endorse Jared Kelner and his contribution to our craft. LINE? is a must read for every actor." Eric Morris: Actor, Acting Teacher and Author of "No Acting Please," "Being and Doing," "Irreverent Acting," "Acting From the Ultimate Consciousness," "Acting, Imaging and the Unconscious," "The Diary of a Professional Experiencer" and "Freeing the Actor"
"I wish I had a dime for every actor who has told me their biggest fear was memorizing lines. So I was delighted when I discovered Jared Kelner and was able to introduce him to my students. The response to LINE? Was so positive. The actors felt they had received valuable tools to overcome their fears and move forward in their work with confidence. Jared's positive enthusiastic style is so encouraging it's a pleasure to be in the classroom with him." "OK Actors, Quiet your mind and get this book. It will change your life for knowing your lines forever." Tim Phillips: Founder of The Tim Phillips Studio in Los Angeles and author of "Audition for Your Career, Not the Job: Mastering the On-camera Audition"
"Bottom line, the memory techniques taught in LINE? work. Any actor who's ever struggled to remember their lines needs to buy this book and read it right away. I only wish I learned this memorization method years ago." --- "Whether you're a novice cast in a community theatre production or a professional actor whose Teflon brain is causing you to lose jobs, LINE? will save your life. This is the best monologue and dialogue memorization system that I have ever come across. Jared Kelner breaks the process down into simple steps that will help you memorize your lines quickly and creatively. I am highly recommending this book to the students I teach and the actors I direct."